The Concert Band provides a musical environment that challenges individual players as well as focuses on developing skills as an ensemble musician. 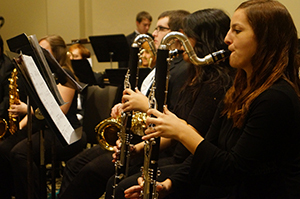 Meeting in both Fall and Spring, the Concert band performs two concerts each semester. The ensemble studies and performs works representing the vast scope of the large wind band tradition and is open to all UT-Martin students. Additionally, the Concert Band provides opportunities for music education majors to gain performance experience on secondary instruments. Community musicians are also welcome to participate in the ensemble. For further information regarding the Concert band please contact Steve Barnett at sbarne28@utm.edu.